Michael Smith and Steven Devor have gotten away with fraud – again. Not only did the duo publish another fraudulent study in a different scientific Journal, but that Journal is refusing to retract or correct Smith and Devor’s fraud. For those new to our blog, Devor is a defendant in a lawsuit alleging scientific fraud. Smith worked under Devor as a PhD candidate on multiple studies. Neither the ACSM, nor Ohio State University, nor CSU Chico has acted on Smith and Devor’s fraud. ACSM retains Devor as a fellow, and Smith as a Registered Clinical Exercise Physiologist. Ohio State and Chico State continue to employ Devor and Smith. were instructed to strictly avoid all grains, dairy products, and legumes. All modern, processed foods including any form of processed sugar, soft drinks, and coffees were also excluded from the diets of the subjects. It really wasn’t a Paleo Challenge. The truth is nobody really knows what people actually did because they didn’t write down what they ate, just whether it could score them points or not. Apparently it’s normal for IJES to publish final drafts that no reviewer has seen. What is the point of peer review if peer reviewers don’t review the final drafts before they’re published? A Paleolithic diet, as first described by Eaton and Konner, was implemented for all study participants (11). Subjects were advised to increase their consumption of lean meat, fish, eggs, nuts, fruit, and vegetables and were instructed to strictly avoid all grains, dairy products, and legumes. All modern, processed foods including any form of processed sugar, soft drinks, and coffees were also excluded from the diets of the subjects. No specific macronutrient recommendations were made, as the study design wanted to closely mimic a real world model that would incorporate food choices made by the average consumer. Intake of specific proportion of food categories (e.g. animal vs. plant foods) was also not given. Furthermore, the subjects did not follow the specific directions above, and were not even instructed to. Lyons is trying to present the “ad libitum” and “unrestricted” qualifiers as an excuse for the subjects eating non-Paleo food. Yet his excuse does not work. there is little data pertaining to the application of the less restrictive, more practical Paleo guidelines that do not impose limits on the intake of any approved food sources. 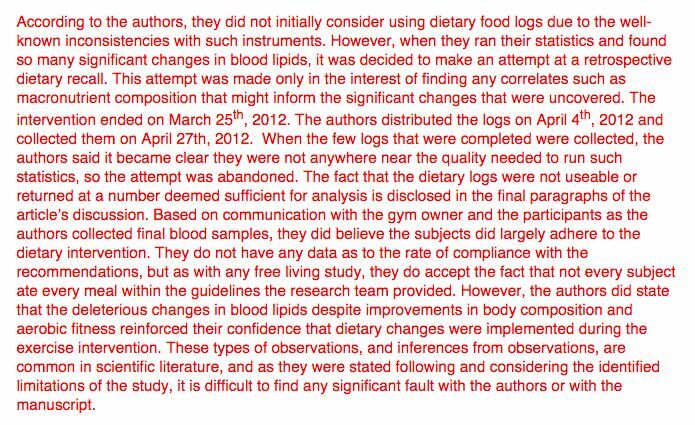 Our study, which utilized the less restrictive guidelines that appear to be more commonly followed by many Paleo dieters, found deleterious effects on blood lipids following a 10-week Paleo intervention. In other words, Smith and Devor stated that the subjects strictly followed Paleo guidelines on food types but ate as much of the approved Paleo foods as they wanted. And here’s the problem that Lyons is wishing away: the nutrition challenge allowed the subjects to freely eat non-Paleo foods but Smith and Devor say it didn’t. Smith and Devor should not have attributed the study’s results to a nutritional prescription they didn’t follow. This is misleading. Smith and Devor certainly have no data about what the subjects ate. 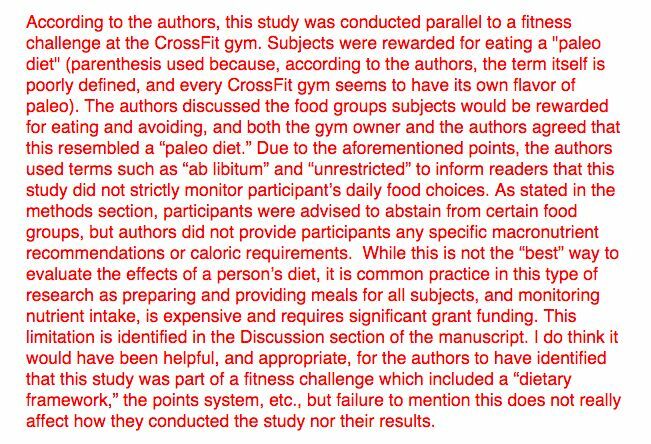 But the subjects were not instructed to strictly follow the Paleo diet, so it cannot be said that the subjects failed to comply with recommendations by eating non-Paleo foods. The subjects could have eaten pizza and ice cream and been in full compliance with their gym’s challenge. The IJES Paleo study doesn’t have a compliance issue. It has a Michael Smith and Steven Devor fraud issue. An “ad libitum” Paleo diet either means “ad libitum” intake of Paleo-approved foods, or it means nothing. Thanks, but no thanks. 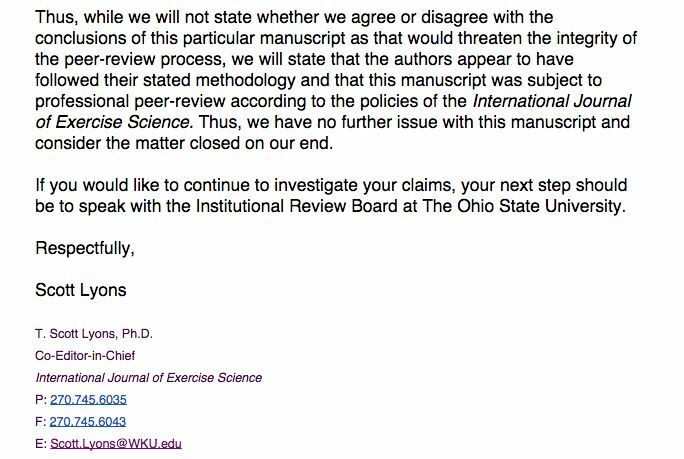 If Ohio State University sees no problem with CrossFit fraud, does anyone think that they’ll mind Paleo fraud? And lastly, what would truly “threaten the integrity of the peer-review process” is for academic institutions to continue tolerating data fabrication. 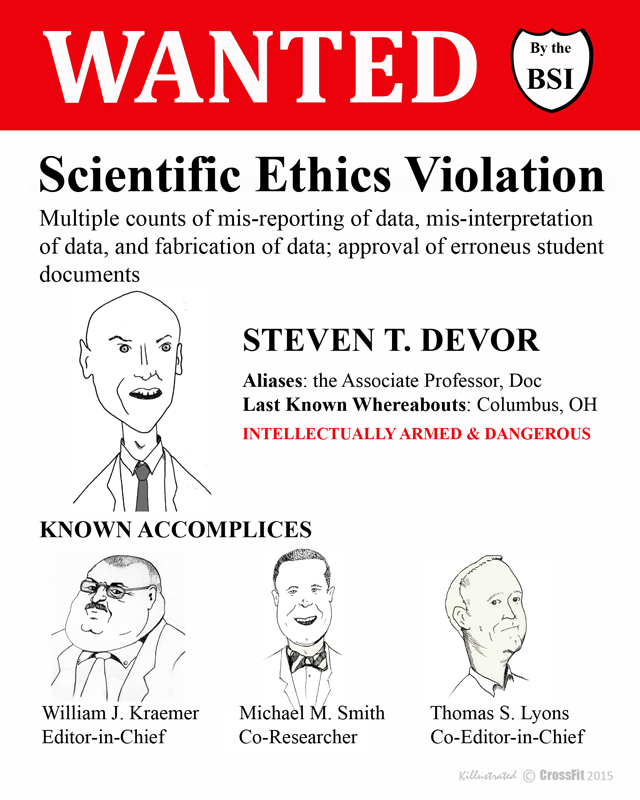 If ACSM, NSCA, and IJES permit Smith and Devor’s repeated fraud, and cannot verify the integrity of their own published work, what is their worth as scientific institutions? 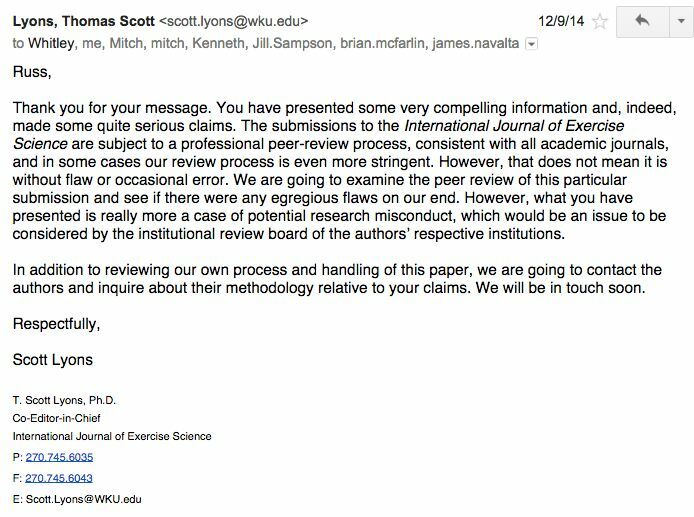 How much fraud can Devor and Smith commit before ACSM, NSCA, and IJES take action?